The freshman series, iZombie, has Tuesday night at 9 p.m. all to itself as The Flash and Agents of SHIELD are both on hiatus. The show, based the Vertigo comic series, is down to its last three episodes starting with tonight's 'Astroburger.' Major loses a friend to suicide and Liv investigates the strange circumstances. Check out the preview and a behind-the-scenes featurette. WHAT’S REAL – AND WHAT’S FANTASY — When someone close to Major (Robert Buckley) dies of an apparent suicide, Liv (Rose McIver) consumes the brains resulting in a mix of reality and paranoia. 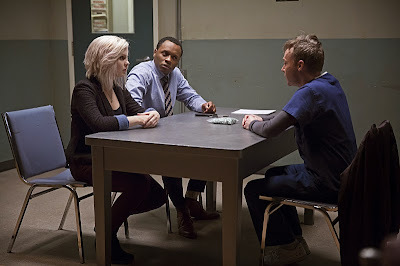 Clive (Malcolm Goodwin) questions Major and learns of a secret computer file that may contain important details in the investigation – and finding the killer. David Anders and Rahul Kohli also star. Michael Fields directed the episode written by Kit Boss (#111). Original airdate 5/26/2015.